SUMMER FINAL EXAMS 2018!! Great Gift for College Summer Semester 2018! This package is a great gift option for students, friends, family, or yourself! A high-quality, corrugated, white, tab-locking, mailer box measured 12.5inches in length, 9.5inches in width, and 4inches in height. This package contains 50 items. Makes for a great gift! Perfect for college students, final exams, studying, birthdays, military personnel, holidays, special occasions, and more! Great value and great to even purchase for yourself! The CollegeBox mailer is closed, sealed and packaged inside of corrugated, kraft, shipping box for extra protection. COLLEGE SUMMER FINAL EXAMS 2018: Perfect gift for college students who need an extra boost for finals week. Study groups will go crazy for this survival kit to get them through exams. 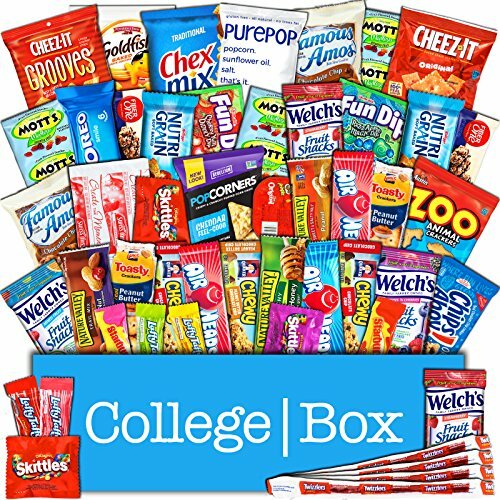 If you have any questions about this product by CollegeBox, contact us by completing and submitting the form below. If you are looking for a specif part number, please include it with your message.